Second-order nonlinear optical processes play a pivotal role in both classical and quantum applications, ranging from extension of the accessible frequencies to generation of quantum entangled photon pairs and squeezed states. This nonlinearity is ruled out, unfortunately, by inversion symmetry in materials lying at the heart of integrated photonics, for example, silica, silicon and silicon nitride. Now, a team of researchers led by Professor Xiao Yun-Feng and Professor Gong Qihuang at Peking University, in collaboration with Professor Liu Yu-Xi Tsinghua University (China), Professor Qiu Cheng-Wei at National University of Singapore (Singapore) and Professor Yang Lan at Washington University in St. Louis (USA), has demonstrated second harmonic generation (SHG) induced by symmetry breaking at the surface of a silica whispering gallery mode (WGM) microcavity. This work has been published online in Nature Photonics. SHG, a fundamental second-order nonlinear optical effect, is the process in which two photons with the same frequency interact with the nonlinear material and are combined to generate one photon at twice the frequency. In materials with inversion symmetry, SHG is prohibited due to the symmetric potential experienced by the electrons. However, at the surface/interface of these materials, the electrons see a different potential at the two sides of the surface/interface, naturally giving rise to the surface symmetry breaking. Thus, the inversion symmetry breaking enables second order nonlinear effects at the surface, opening up a significant door to characterize the surfaces/interfaces that are of great importance in physics, chemistry, biology and electronics. "Unfortunately, the nonlinearity from intrinsic symmetry breaking at surface is usually extremely weak in previous studies, and only thousands of second-harmonic (SH) photons are generated by a 50-fs pulse with a 500 GW/cm2 averaged intensity," said Cao Qi-Tao, a graduate student at Peking University. 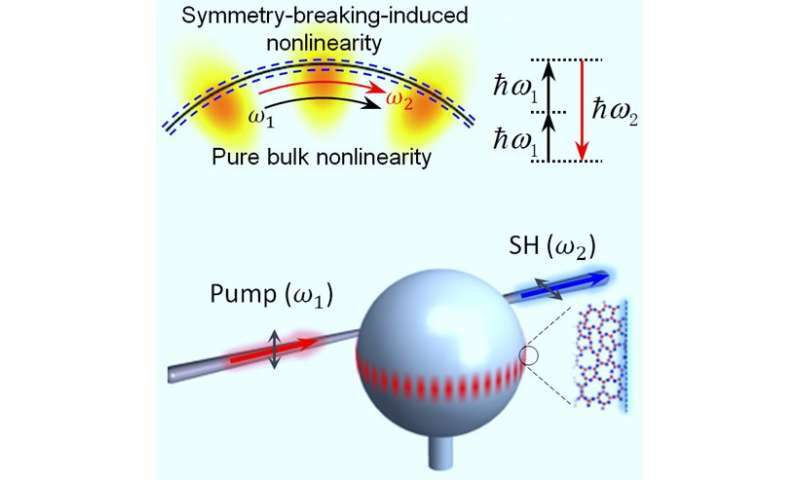 In this work, the physicists used the ultrahigh-Q WGM microcavity to realize dual-resonance enhancement of the symmetry-breaking-induced nonlinearity at surface. The WGM resembles the acoustic resonances in the whispering gallery in St. Paul Cathedral in London, where the acoustic wave from a speaker on one side of the gallery circulates the building, reaching the listener at the other side. Thanks to the low propagation loss and the low volume, the ultrahigh-Q WGM microcavities, as the optical analogue, trap photons that can circulate inside the cavity for up to hundreds of thousands of times, so that the intracavity power is boosted consequently for up to five orders of magnitude with respect to the input. "The ultrahigh Q is indispensable in boosting the SH power, while the corresponding ultra-narrow linewidth also presents a challenge for us to make sure that both the input light and its second harmonic signal are on resonance with the cavity modes," said Zhang Xueyue, a former research assistant in the group of Professor Xiao and an undergraduate at Tsinghua University, now a graduate student at Caltech. "Here, we employ the thermal effect and optical Kerr effect to dynamically achieve this goal." These effects induce a frequency shift of the cavity mode and help to dynamically realize a stable matching of both the pump and SH resonances almost simultaneously, also known as phase matching condition. As a result, the second harmonic is achieved under a pump power of less than one milliwatt, which is the lowest among the powers reported in centrosymmetric materials. The corresponding conversion efficiency is unprecedentedly as high as 0.049 percent W-1, fourteen orders of magnitude higher than that of the non-enhancement case in conventional surface nonlinear optics. In addition to ultrahigh efficiency, the unambiguous identification of the surface nonlinear effect is also a pivotal feature which makes the cavity-enhanced surface analysis possible. In silica, the bulk multipole effects could disturb the deterministic study of surface properties, which has long been highly challenging in surface science. To further identify the origins of the nonlinear signals, the researchers analyzed the pump polarization and the spatial distribution property of the generated second harmonic signal. Consequently, they experimentally achieved second harmonic only from the surface symmetry-breaking-induced nonlinearity and eliminated the bulk multipole effects, instead of the mixture of the two contributions. "This experiment achieves the highest record of SHG efficiency in silica photonics," said Professor Xiao. "More importantly, the work may open up the opportunity to combine the surface specific detection and the resonance enhancement from microresonators. The mechanism and scheme we learned and developed in this work, including the dynamical phase matching method, will act as the ground stone for various applications, especially in ultra-sensitive surface analysis."